The Dual Core CHEAP Android Mini Computers have arrived in the market. Mini Android computers have improved quite a fair bit over our last review and are getting more popular around the world and in Singapore, too. The Raspberry PI, a similar device is way more versatile, but the Android mini computers like the UG802 and MK808 are easy to use and designed for plug and play. The technical specifications have jumped significantly in two months. It was only about a few weeks ago that the UG802 was first launched, a dual core Android Mini Computer and this week, a competitor has emerged with the MK808 – a new and improved RK3066 Dual Core Android Computer which improves with two WiFi antennas, improved cooling, CPU up to 1.6Ghz, increased storage from 4GB to 8GB and the device comes preloaded with Android 4.1 (Jelly Bean). Best of all, the pricing still remains in theUS$65-US$75 region (Search MK808 at AliXpress) . I think this could be a good cheap and viable alternative to the Nexus Q that Google is proposing. I am impressed by the portability and all you need is a TV or monitor. With Plex and XBMC installed, it provides a full media experience at an extremely low-cost. Also, Android as an OS has quite a fair bit of useful applications, including streaming media, music, like Netflix, Hulu or the Chinese equivalents like Kuai Bo, Sopcast (they all work by the way). You could also use it as a torrent box, (with uTorrent or aTorrent for Android) and it would be a very low energy consumption torrent box. Or how about loading an Airplay receiver on it, and it would be a good competition for your Apple TV. XBMC for Android is still under development but the nightly is performing quite well even without h/w acceleration on the UG802 and we would expect the same for the MK808. Currently the video only shows playback of a SD Video and we will update once we have confirmation of HD performance. 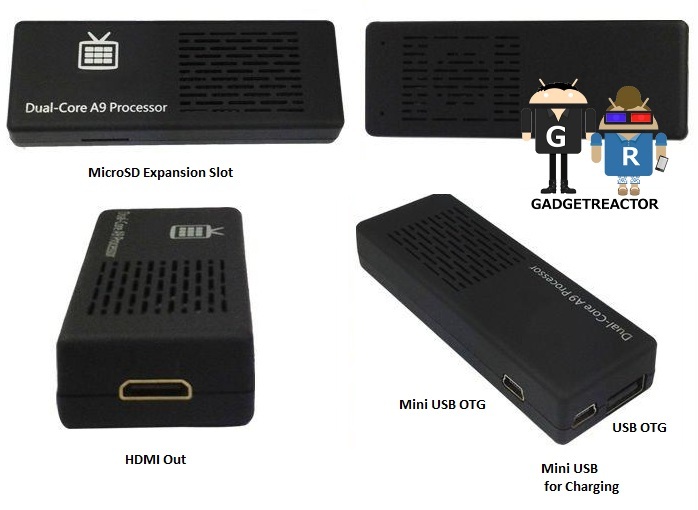 The MK808 comes with all the essential accessories out of the box to let you connect to your TV and your USB devices to control it. You can attach two USB devices such as Ethernet to USB adaptor or a wireless keyboard/mouse combo dongle, or even a gamepad controller, and expand its storage with a 1 TB USB Harddrive. For additional devices, a USB hub is supported as well. Bluetooth functionality is lacking and it doesn’t have support for connected bluetooth dongles as well, so that means you can’t use your PS3 sixaxis controller on it, yet, or hook it up with bluetooth stereo. The MK808 also offers other computing advantages such as internet browsing, word processing, etc, and its very scalable. The previous version MK802 was able to fully run Linux (Ubuntu, Puppy Linux). I thought it might be interesting to SMEs with technology cost constraints. This could easily replace a laptop (SG$1000). The cost comparison is an Android Mini PC, (SG$100), keyboard, mouse (S$30), monitor (S$200) = S$330. And if you need to bring work home, you don’t need to lug a laptop back, it could easily pop into a pocket. The simple pleasures of technology. For American shoppers, Amazon currently carries the SS808 at $89.00 & this item ships for FREE with Super Saver Shipping. It is the SainSmart SS808 PC-On-A-Stick/ Mini Computer, Android 4.1 OS, Dual Core 1.6 GHz A9 Processor, 1GB DDR3, 8GB Internal Storage, Dual WIFI Module On Board, OTG Port, Black, and looks exactly like a MK808 rebranded. Since you can buy it from Amazon, you are also entitled to Amazon perks like the free shipping and excellent return policy. This helps make up for the increase in price. Also, if you are looking for an stylish input device, how about the Koolertron Air Mouse + Keyboard from Amazon? It offers Wii-like mouse control through intuitive wave-and-click. Flip it around for a thumb-sized keyboard. can any usb keyboard work with mk808? any way to not have a keyboard and the mk808 still function? can a regular keyboard work with mk808? hi matthew, the mk808 is compatible with a large majority of USB keyboards, even wireless ones as long as they are not bluetooth. You could control the mk808 with a mouse, droidmote, other remote server/client software. What do you mean by a regular keyboard? If you are referring to a PS/2 port, then no, those are not compatible.